The original three Ace Attorney games are heading to the 3DS in a special compilation. According to the latest edition of Famitsu magazine, the first three Ace Attorney games, that is, Ace Attorney, Justice for All, and Trials and Tribulations, are heading to the 3DS in a special compilation edition. 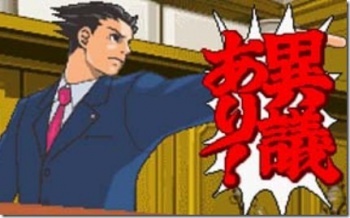 The compilation will be called Ace Attorney 123: Wright Selection, and will feature enhancements on the new handheld, such as the addition of stereoscopic 3D. Famitsu suggests that both an English and Japanese version are in the works, as the Japanese version of the collection will also have the English-language option present. It's worth noting that Japanese versions of previous Ace Attorney games have had an English language option. A limited edition version will also be available, which will come with a drama CD, and first-print copies will come with a download code to get an extra arranged BGM and an original background image. The compilation will be released in Japan on April 17 for 3,990 yen (~$45 US). There was no word on when it will release in any other markets. This isn't the first time the spiky-haired lawyer has seem a re-release of his trilogy. The games were initially available in Japan on the Gameboy Advance, and were brought over to the West on the DS. They've also had a WiiWare, PC and iOS release since then. This is great news for Ace Attorney fans, as the original three games were easily the best in the series. Here's hoping it actually gets a physical release this time, and maybe, possibly, could we perhaps get an English localization of Ace Attorney Investigations 2 please?.